Submitted by lynn on Wednesday, February 19, 2014 - 9:02am. 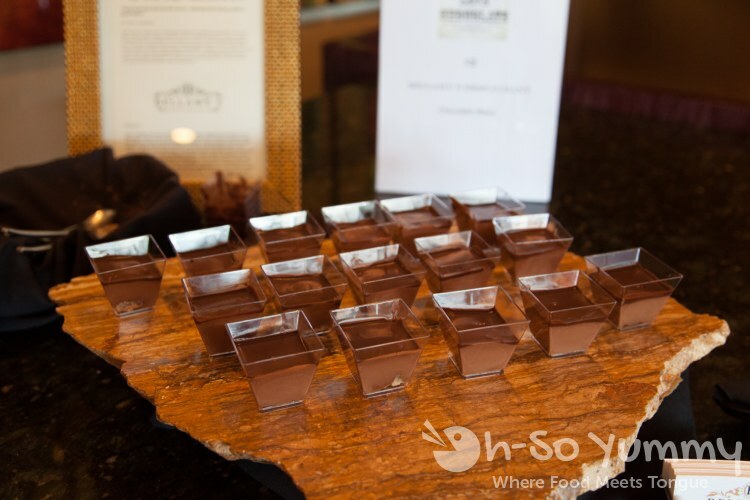 We attended the Escondido Chocolate Festival 2014, also known as "For the Love of Chocolate". This was the first time we had ever heard of this event so we were definitely excited to check it out! 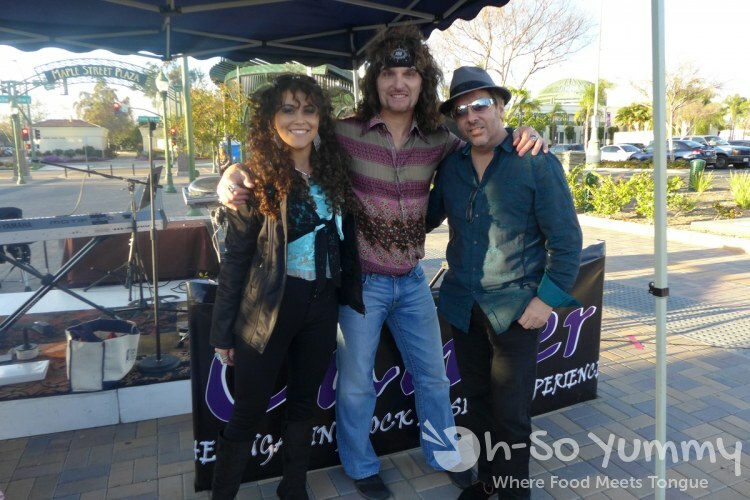 The event was on Saturday February 8th 2014 from 1 to 5pm in downtown Escondido, which had the easiest parking of any event we've gone to (multiple free lots and street parking). Tickets were $20 for designated driver (no alcohol) and $35 including alcohol if you purchased before the event and an extra $10 on the day of. 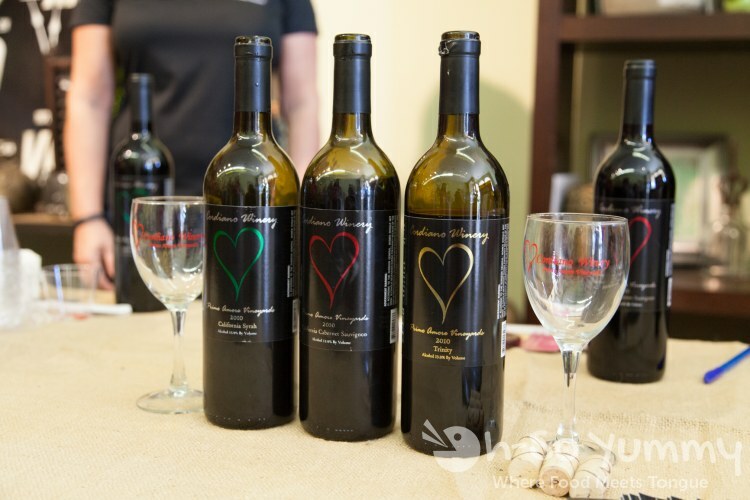 There were 25 participating locations, a mix of restaurants and businesses hosting the chocolate-inspired treats, wine and beer. Just about every location was on Grand Avenue so we pretty much followed the map in order. After grabbing our event tickets and alcohol wristbands, we were ready to go. 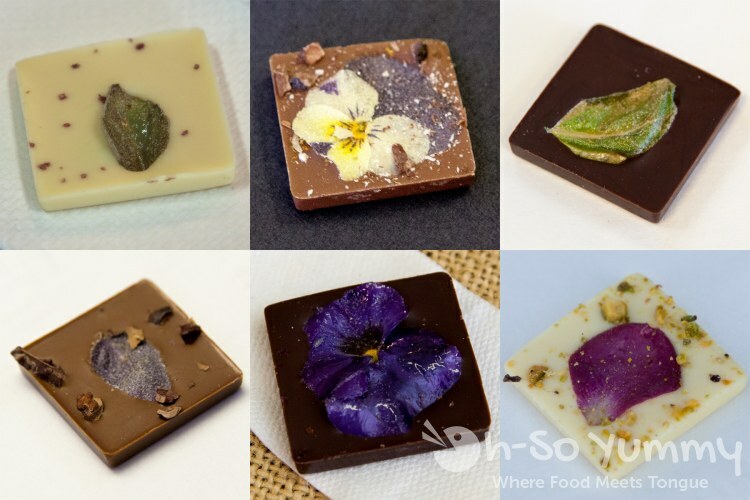 Coco Savvy Chocolates - (clockwise starting at top left) White Chocolate with Lemon Basil, Milk Chocolate with Viola and Orange Zest, Dark Chocolate with Sweet Basil, White Chocolate with Pistachio and Rose Petal, Dark Chocolate with Viola and Merlot Infused Sea Salt, Milk Chocolate with Opal Basil. 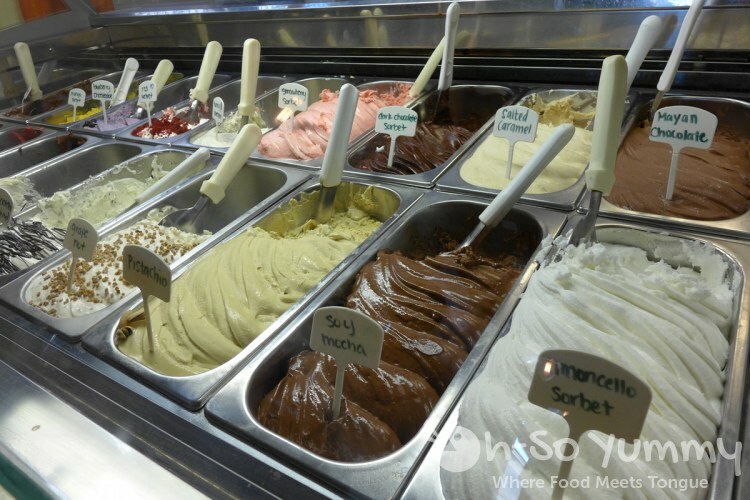 Each flavor was sampled at a different location. These were all fabulous but the sweet crystallized petals and burst of basil leaves made them stand out over other chocolates. La Tapatia - Drummlets in Mole Sauce. The mole sauce on these were made using mexican chocolate (Abuelito by Nestle) among other ingredients. Bellamy's Restaurant - Chocolate Bisou - this dessert is layered with hazelnut in the bottom and a crunchy praline middle with chocolate mousse. 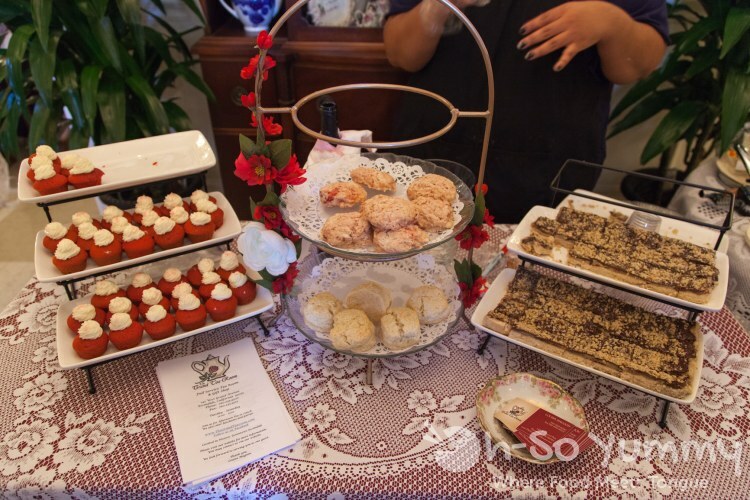 The Grand Tea Room - red velvet cupcakes, scones, and a dessert bar. I don't know what the item on the right was but it was delicious! 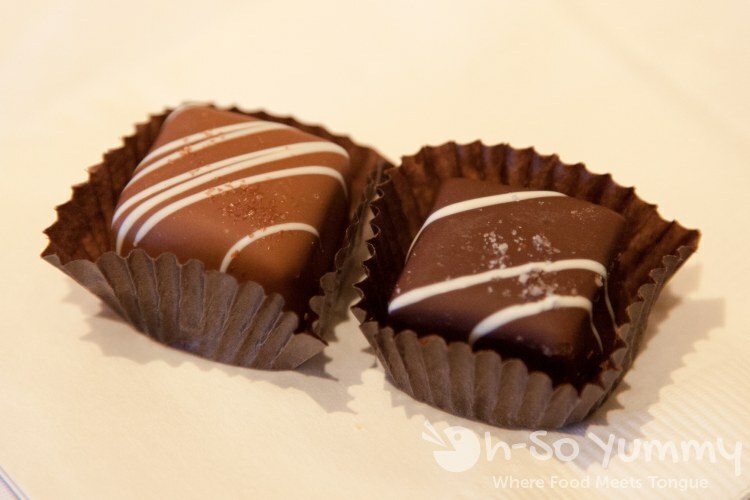 V Chocolates - (first pic) Dark and Milk Chocolate Caramels, (second pic) Toffee. The Caramels were very very sweet, as caramels tend to be. I couldn't eat more than a small bite of the gooey caramel insides. 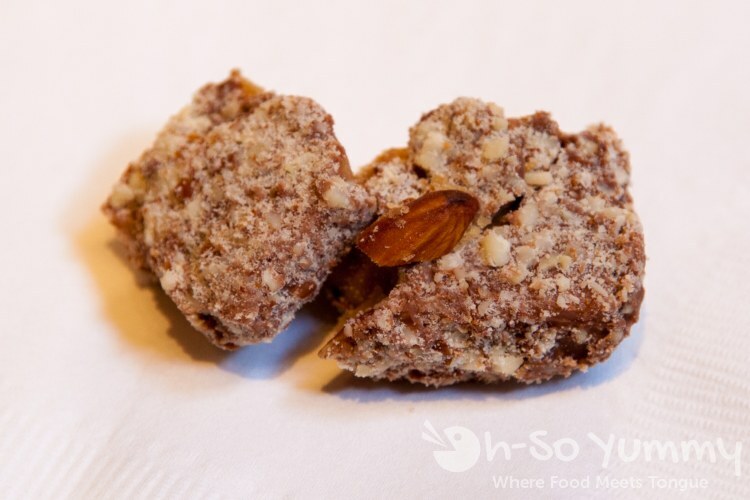 The Toffee was similar to an almond rocca so that worked for me! 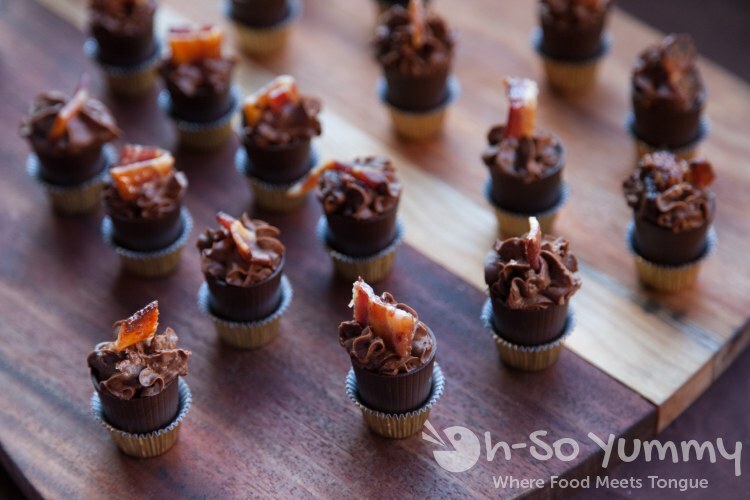 Intertwined Bistro Wine Bar - Chocolate Cups, Mousse and Applewood Smoked Bacon. 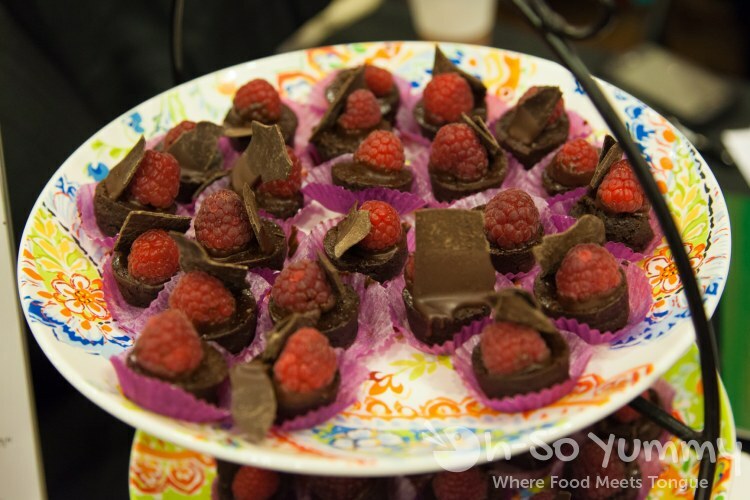 These perfect bite-sized creations were one of the best desserts at the festival. 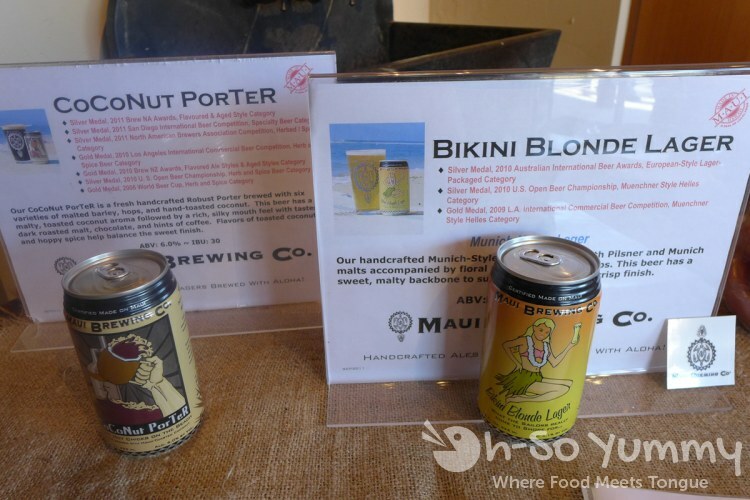 I believe it's not on the menu and was created especially for this festival, but I'd be happy to be wrong about it! Kettle Coffee and Tea Co - Chocolate Croissant. 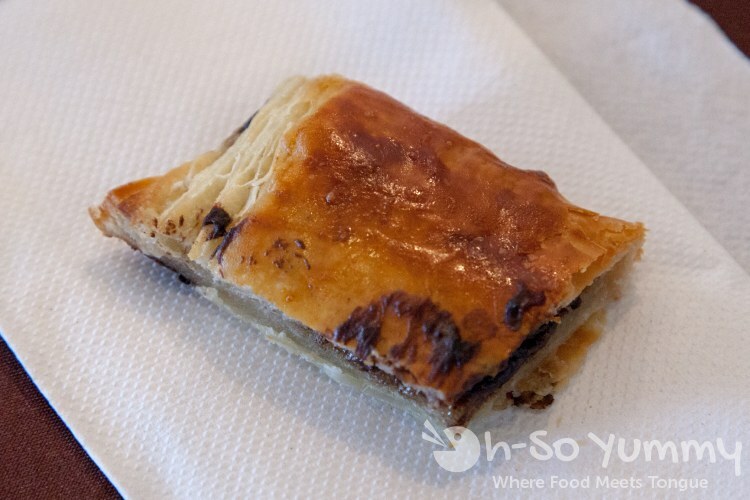 We enjoyed the flaky sweet crust and nibbles of chocolate between the layers. 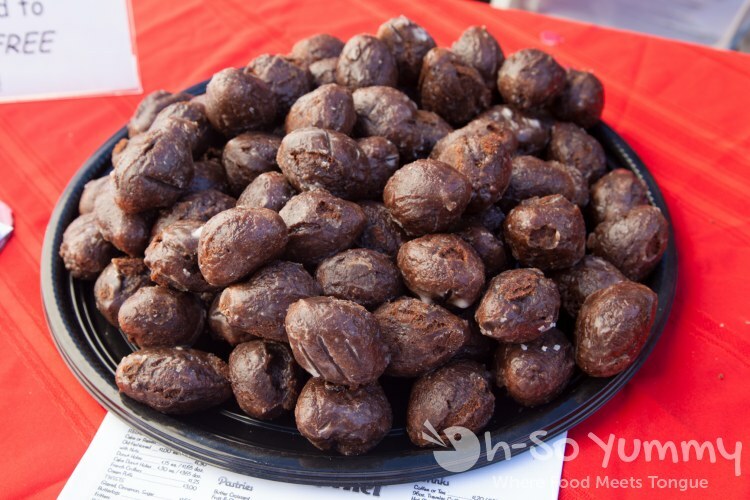 Peterson's Donut Corner - Chocolate Doughnut Holes. It's a doughnut with chocolate flavoring! Enough said! Plan 9 Alehouse - Whoopie Pie. 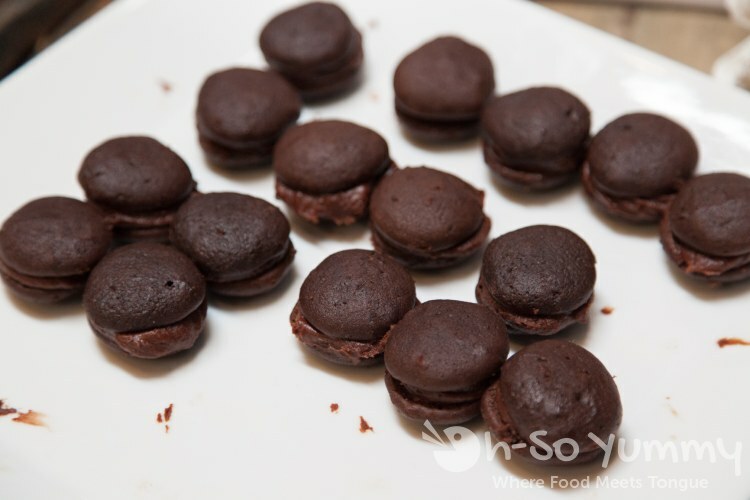 These sure do look like macaroons but they are not. Still, pop them in your mouth and it's decent. Winz Wine Bar - Bacon Chocolate Truffles. 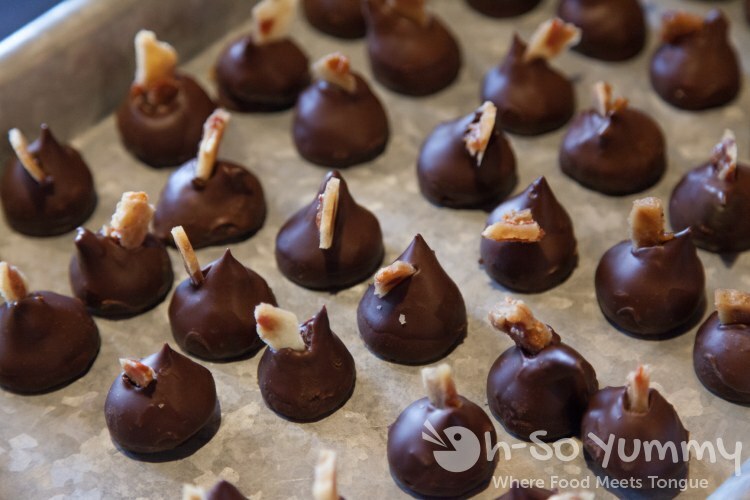 These were really infused with a bacon taste, even in the chocolate portions! It was a bit strong overall. 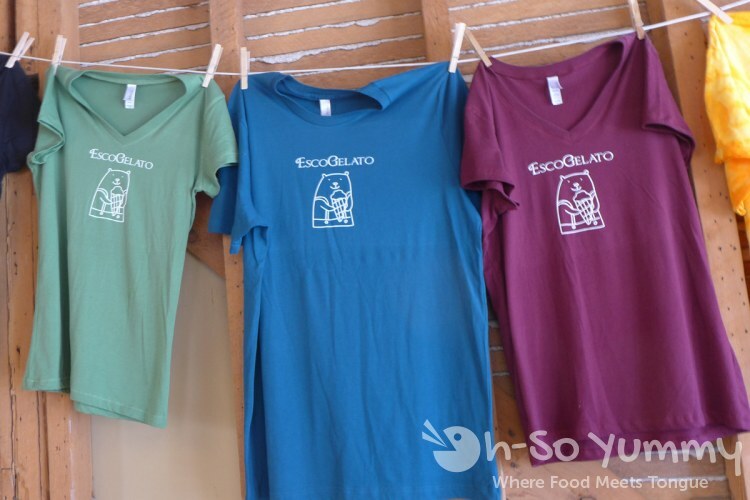 Esco Gelato - Chocolate Brownie Gelato. Deliciously creamy and enjoyable amount of chocolate rations. They also have an adorable hamster(?) mascot that was posted on their outdoor sign and these custom made tshirts. Cuscatlan Salvadorian Cuisine - Pupusas. These are a traditional Salvadoran dish made of a thick, handmade corn tortilla and both flavors (bean and cheese, ground pork) were absolutely delicious! We have never had Salvadorian food before but we'll be back to try other things at this restaurant. 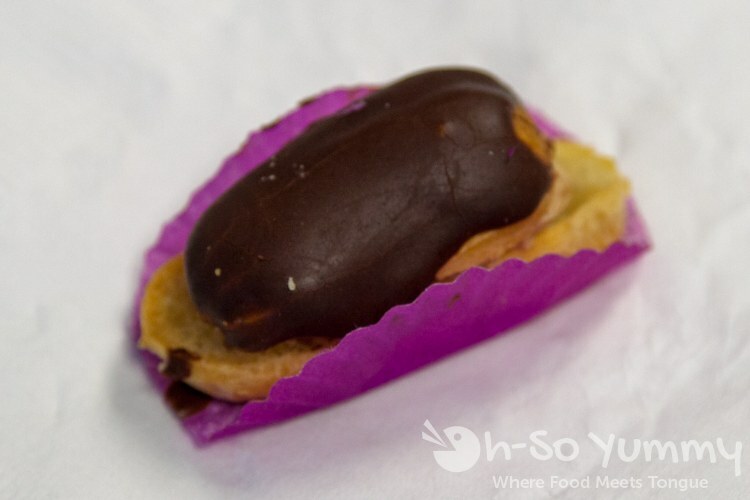 Major Market - (first pic) Mini Chocolate Eclairs, (second pic) Flourless Chocolate Petites. The perfect mini size for snacking on eclairs with a chocolate glazing. I don't remember how the second one tasted though. Lucios American Grill - Chocolate Delights. 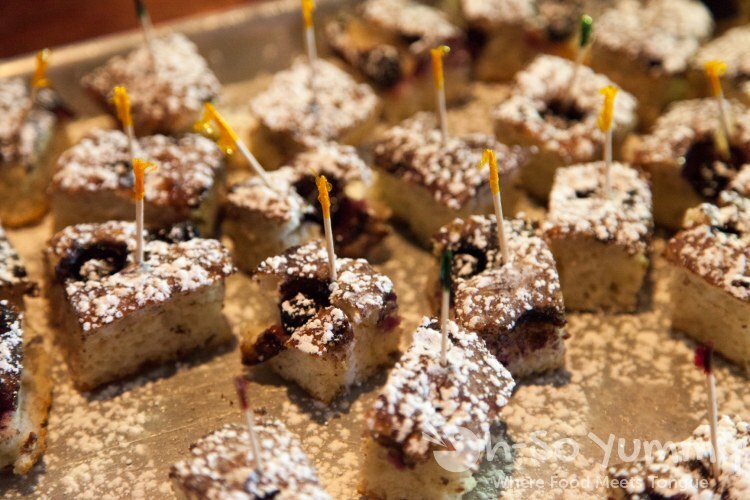 Not sure what the dessert name is but we'll update when we find out. These were also tasty. 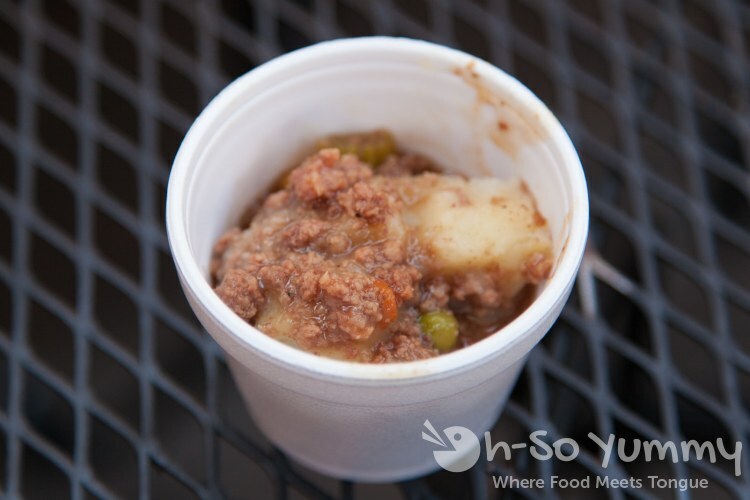 O'Sullivans Irish Pub - Shephards Pie. Everyone in our party liked the hearty flavor and finger-licking goodness. It was also the first "food" we hit that wasn't chocolate! 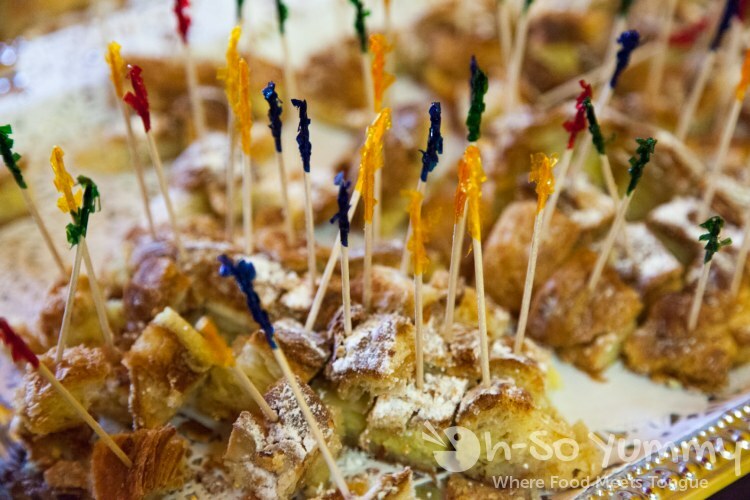 A Delight of France - Almond Croissant. Another perfect and flaky layered mouthful of happiness with an almond twist. 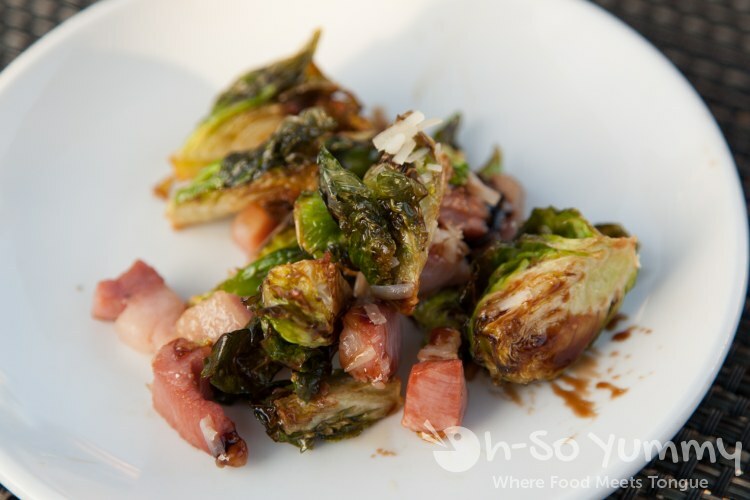 Swamis Cafe - Crispy Brussel Sprouts. 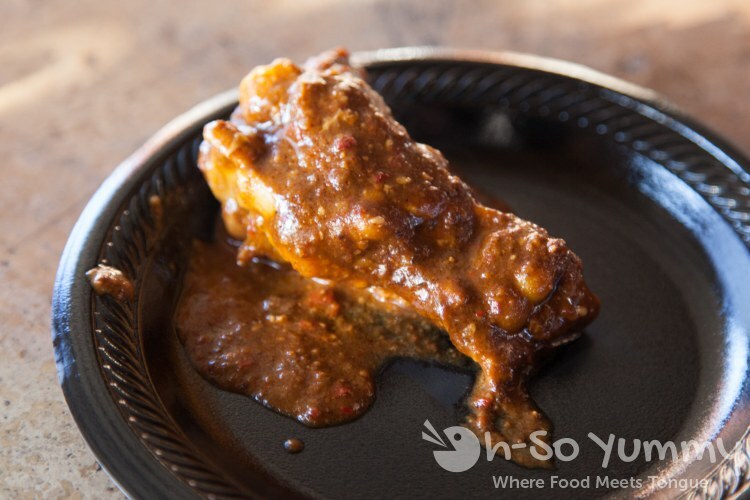 This is a popular appetizer at Swami's (when you're not doing breakfast) and was glazed with a sweeter sauce over healthy brussel sprouts and tender pork belly. 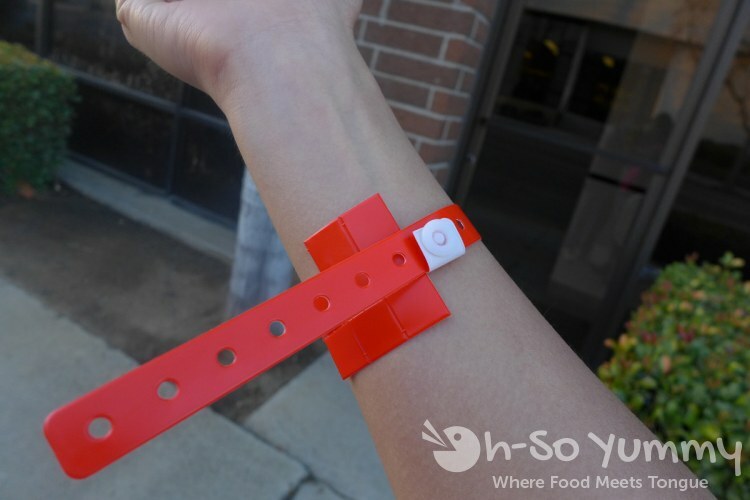 The wristbands were interesting for this event. They came with 10 detachable squares, which you would redeem for each drink you try. At the time of this picture, I had 5 left. 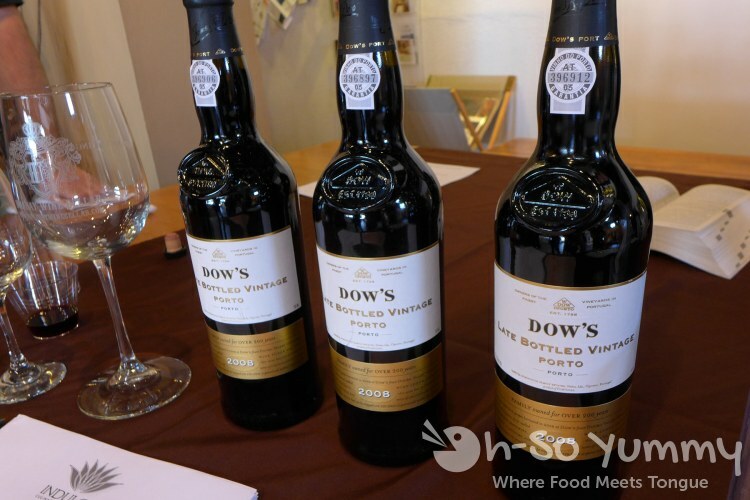 Most places had the standard wine bottles and beer bottles. 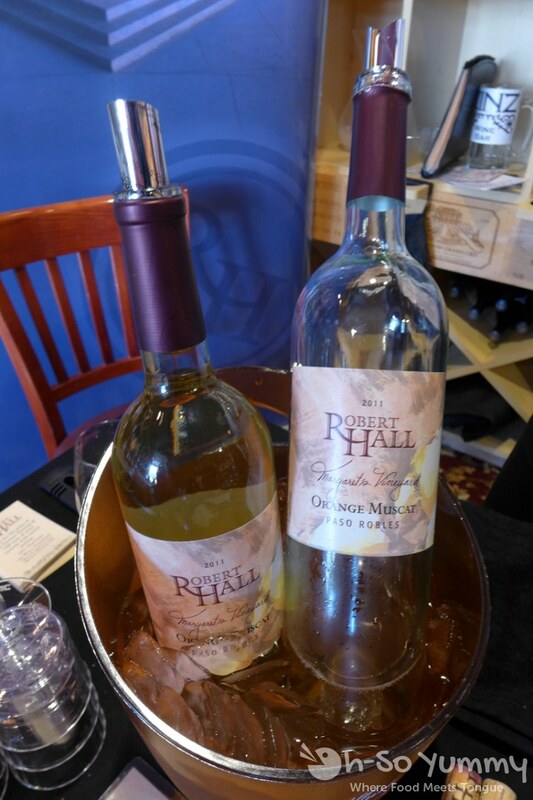 I happened to like the sweet Muscat from Robert Hall. 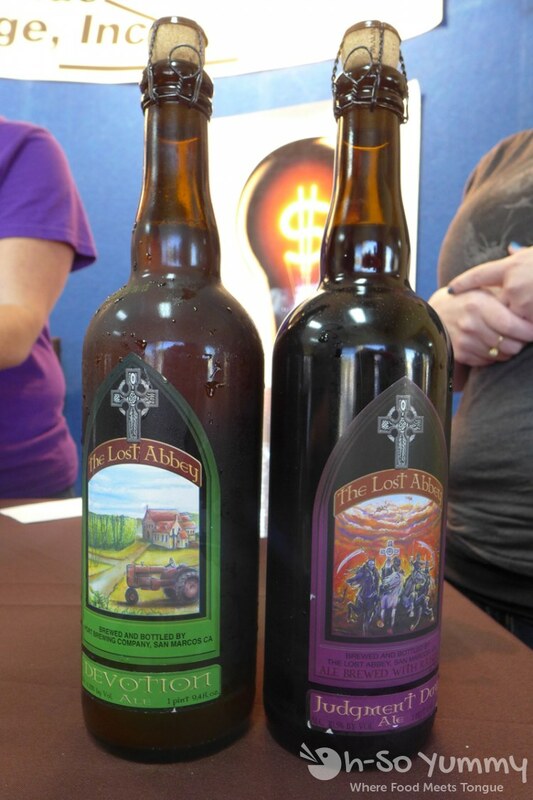 For the beers, I took more pictures than samples. 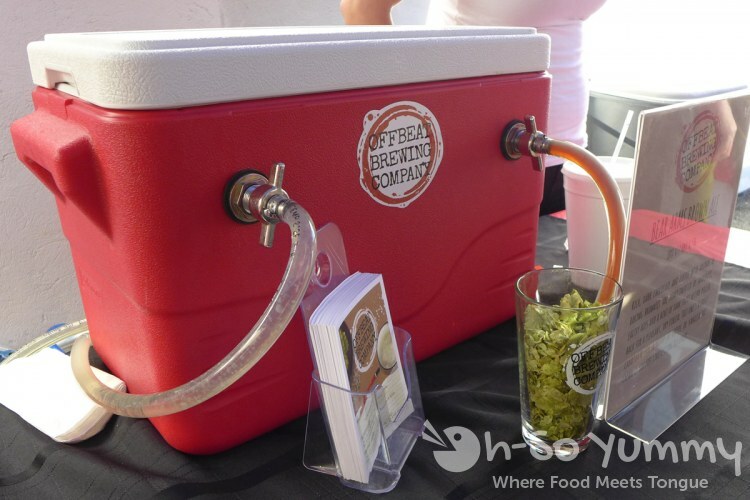 Offbeat Brewery beer came in a big red cooler with taps! 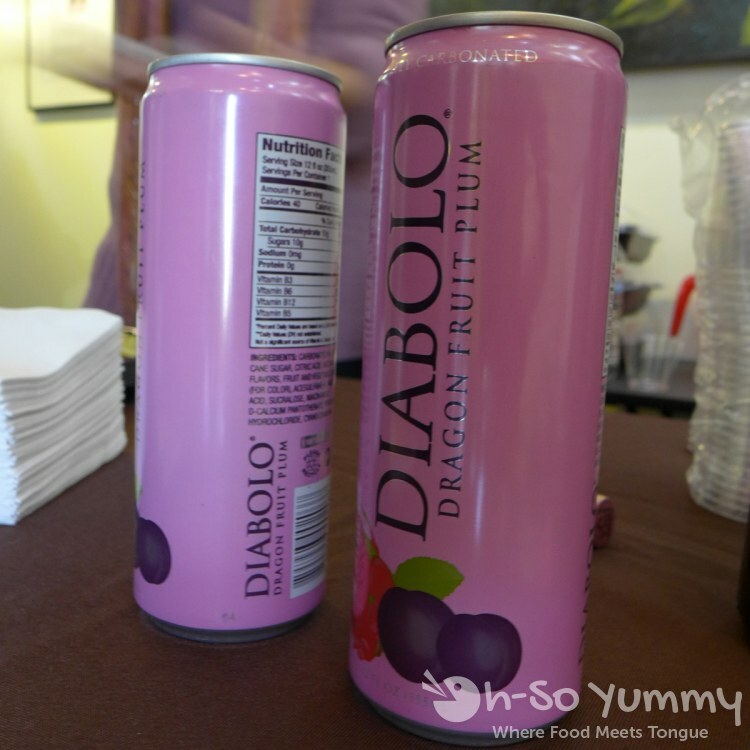 One of the galleries included Diabolo, which was a refreshing sparkling type of beverage. I don't like carbonated drinks much but this one was absolutely worth it! 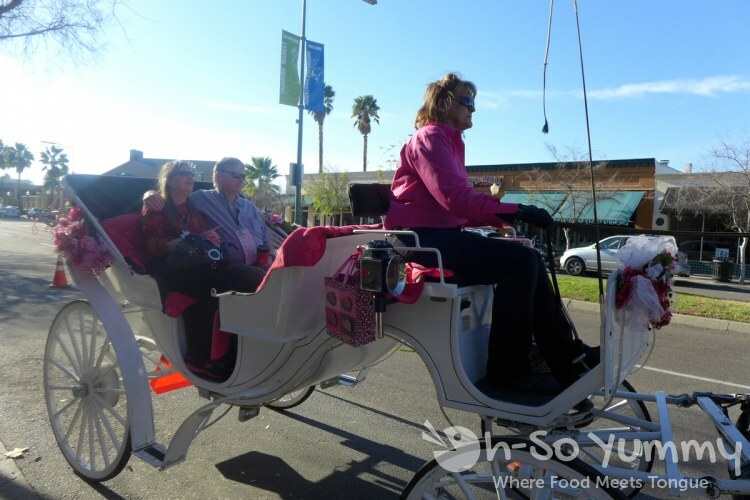 For a donation, you could take a horse and carriage ride to cruise down the main street. Don't forget to tip your driver! The Sweet Street booths were also available for browsing at this event. 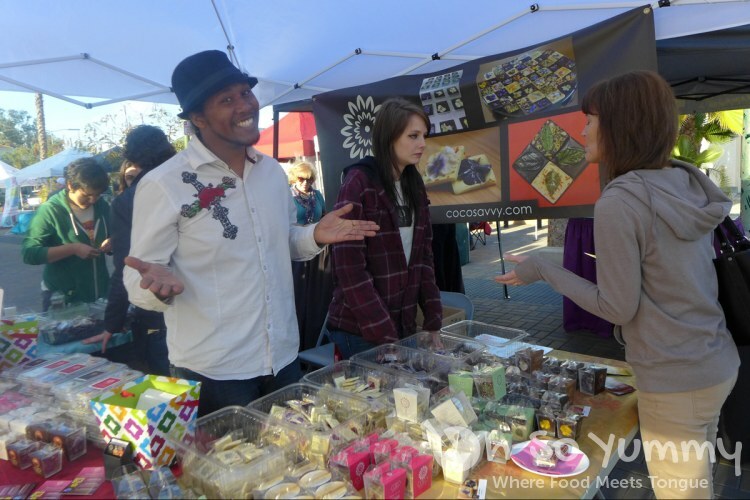 Here is the Coco Savvy one with friendly representatives and more deliciuos samples! As you can see, there are definitely plenty of food and drink available, although it obviously is geared toward the chocolate dessert side! 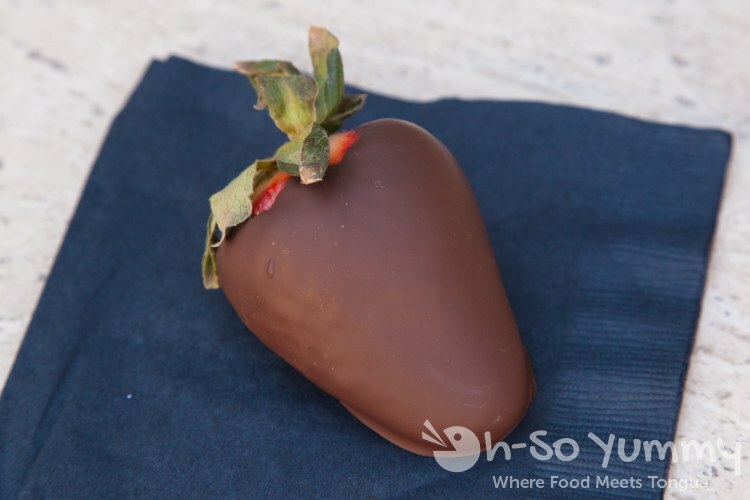 I hope they include more chocolate vendors for next year. I counted only three main ones other than the restaurants! Also, there will be a CHEESE festival in the fall by the same event planners! We hope to attend that event too! Oh what a feast!! Did you think you got your $35 worth of nibbles and drinks? It seems like it's worth the price. 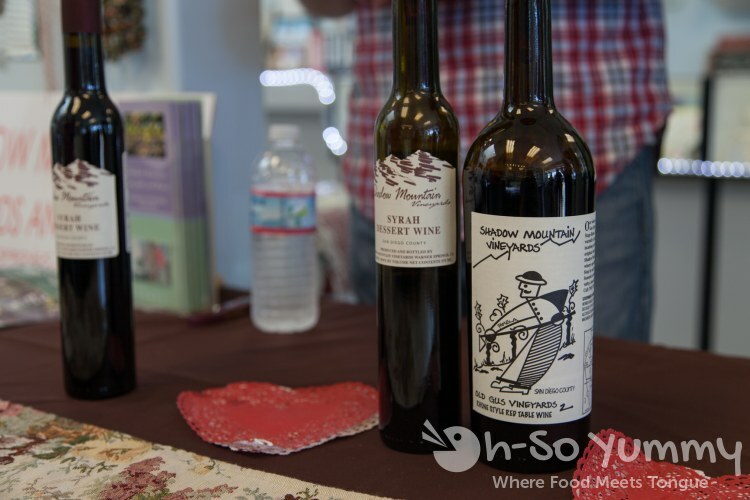 Could you sample as much as you wanted? The flaky chocolate croissant looked amazing. The last two beers in a can look like soda. You usually get one sample per place. We hit all 25 places but we didn't use up all our drink tabs (skipped some beer tastings). We were still completely full at the end of the event. Personally, I could do just the food portion for $20 and be relatively happy (other than needing more exercise later)! One of our party brought a ziplock bag so we began to save chocolates samples as we were getting full! Oh that looked like a lot of fun! It seems like it wasn't totally all chocolate which is good since you still need something savory to go with all of the sweets. 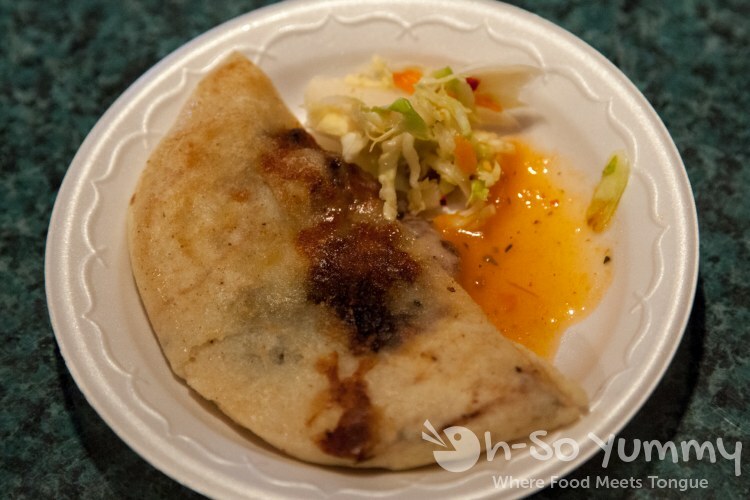 There are a couple of El Salvadorian restaurants in City Heights and near Downtown that have some really excellent food - pupusas are delicious. I can't wait for the fall events! I have a friend who LOVES cheese (more than chocolate) so I'm bringing her! Whoops...I didn't know this was a blog run by more than one person. I just noticed that and posted a comment on another post (not by you...on the Southern food one). 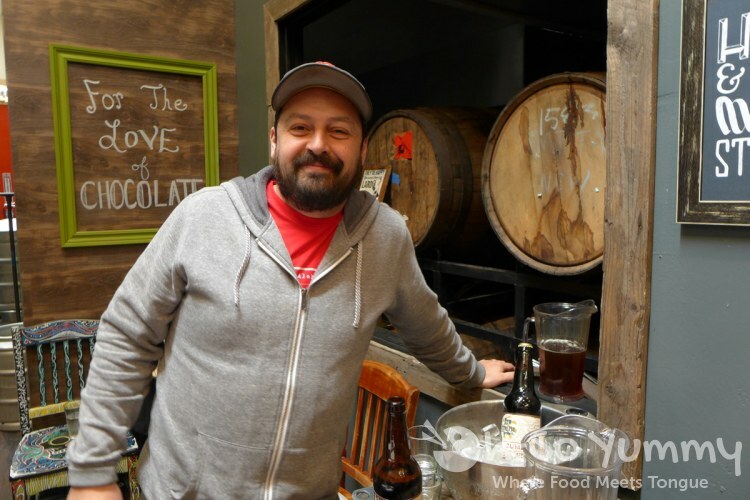 Wow what a fun chocolate event! I love chocolate too (obviously).